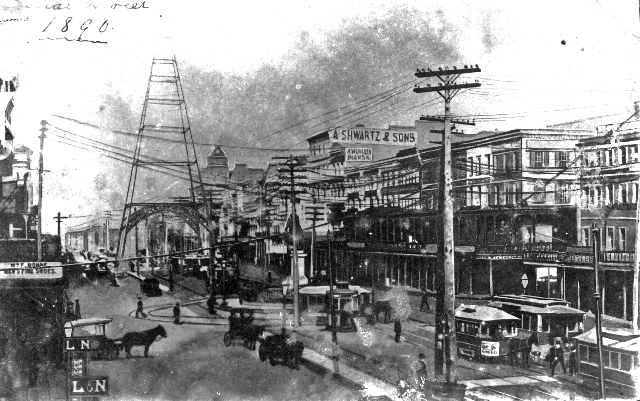 This is an 1890 view from about Camp Street looking toward the statue at St. Charles/Royal Streets and the tower at Carondelet/Bourbon Streets. At the right in this picture, note the difference in size and in roof styles between the two horse cars. (The larger car is not an electric car, since it would be about 5 years yet until electric cars operated on Canal Street, but it is similar in body style to early electric cars.) We can see an Orleans RR car stopped next to the starter's house at St. Charles/Royal, having gone so far about half-way around the Clay statue circle. — Collection of James. H. Adams, Jr.